To celebrate my birthday (which is today), my wonderful husband sent me out on a thrifty shopping spree this past weekend, childcare included. :o) I'm not one for presents, but I love getting "experiences" as gifts, so this was a score! 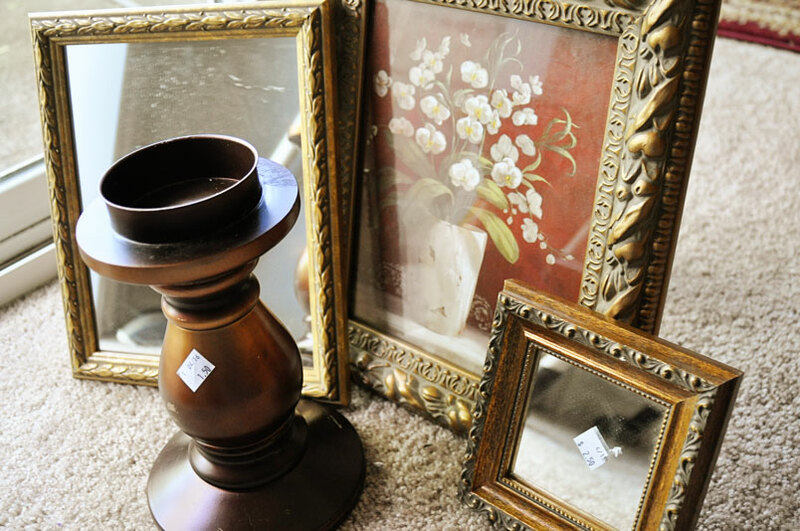 I spent several hours between two local thrift stores, and besides coming home with some cute clothes, I also picked up these fabulous home decorating finds. 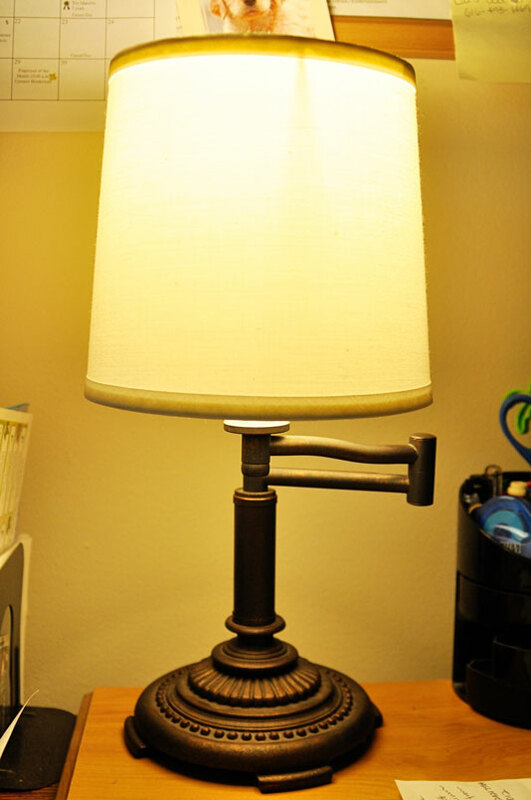 This awesome swing-arm iron lamp (below) cost me $3.50, but I'm sure the original buyer paid way more than that. It didn't come with a shade, so I just used a bland one that I already had. It needs some sprucing up, but it makes me happy to see it sitting on my desk. 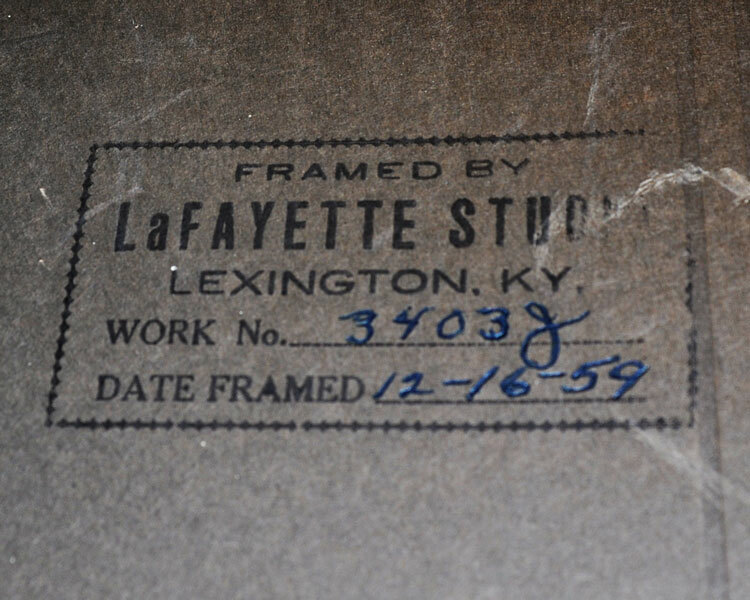 I picked up this frame (which I love) for $6.50. I'm debating whether or not to paint the whole thing, just the green stripe, or leave it alone. It looks nice just as it is, but I'm undecided. I'm also debating whether or not to just use it as it is, or put something in it. Thoughts? 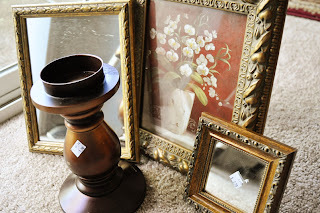 I also picked up these two fabulous mirrors (the bigger one for $2.50, the small one for $2.50), the candle holder ($1.50), and the other frame with the ugly print ($2.50). I plan on painting everything, and gutting the one picture. I'll use that frame for something else. I'm just not sure what color to paint everything, and still need to decide where I'll use them. Here's a closer look at the picture I'll be gutting (below). 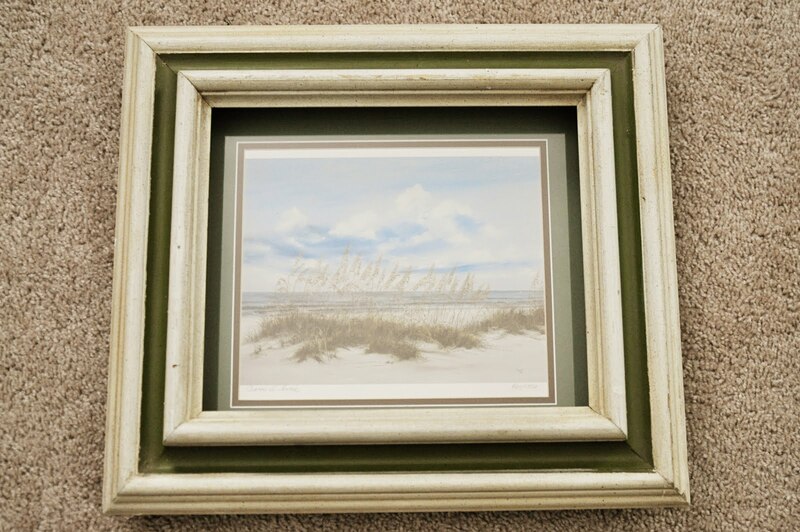 I plan on painting and using the frame. I also picked up this wonderful, larger mirror (below) for $4.50. It's extremely heavy, and must be leaded glass. The frame itself isn't really pretty. It's rather scuffed up, and needs to be painted. But, what color? Here's a glimpse of the back. 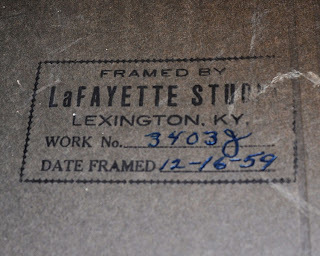 It was framed in 1959! Pretty cool! 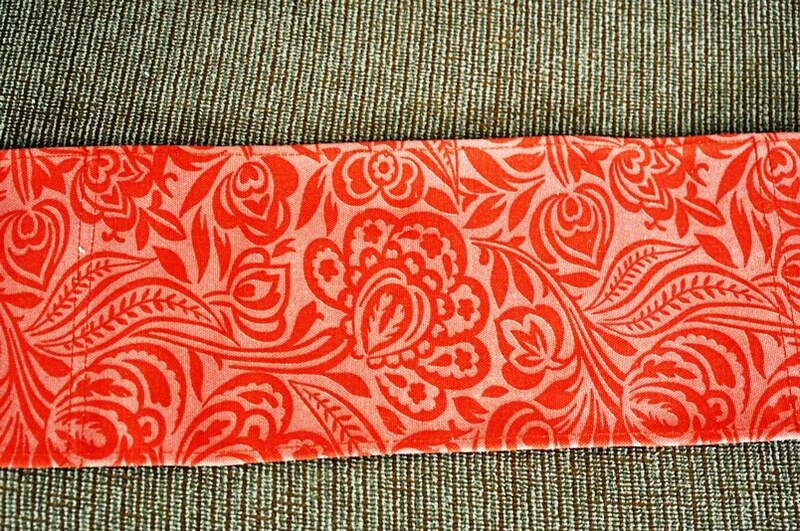 I found this piece of fabric (below) that I instantly loved. It was just 50¢, and I plan on framing it, as fun wall art. 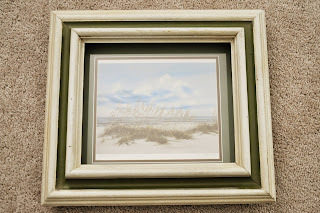 I'm thinking about taking it out of it's current frame and putting into this new frame. 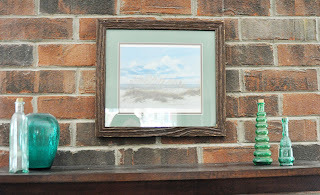 The mat matches the green in the frame, and really makes the piece work. Thoughts? 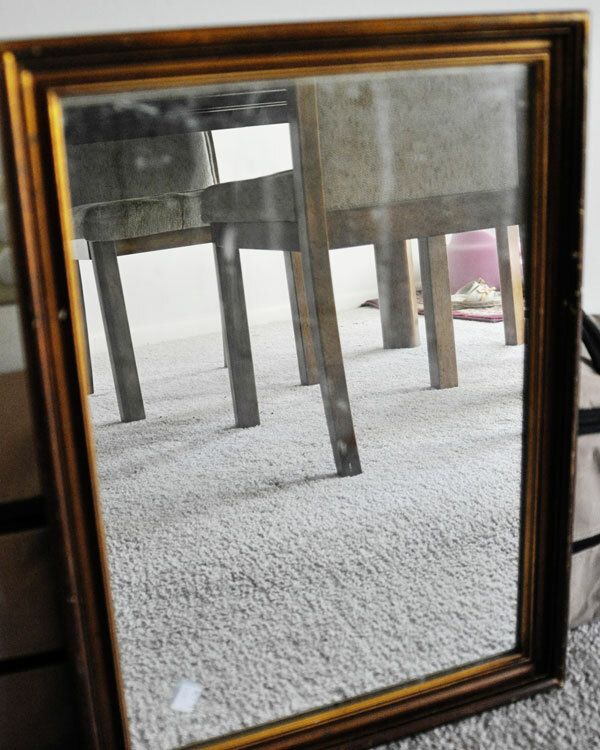 Mirror or picture? Or neither? I love bargain shopping! What a great birthday present. Now, I can't wait to get my spray paint together and get to creating. Oh boy! 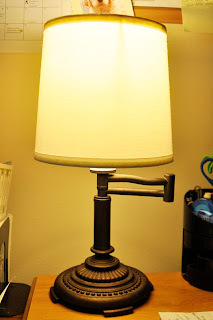 UPDATE: Here's my easy lampshade redo for the lamp at the beginning of this post. What awesome finds! Everyone seems to be painting everything black. You need to do a monogram in that frame. Look what I just found. 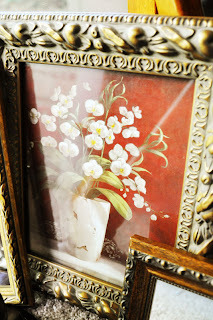 I agree...a monogram would look outstanding in the frame! 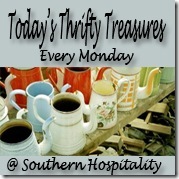 You have some awesome finds and thanks for sharing them with all of us in blogland. You got some great frames -- I really like the really scrolly one! 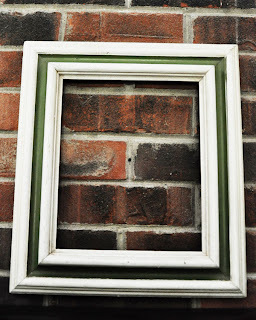 my 2 cents is use the picture in your frame! Good ideas, but I would would go with the picture! Happy Birthday! 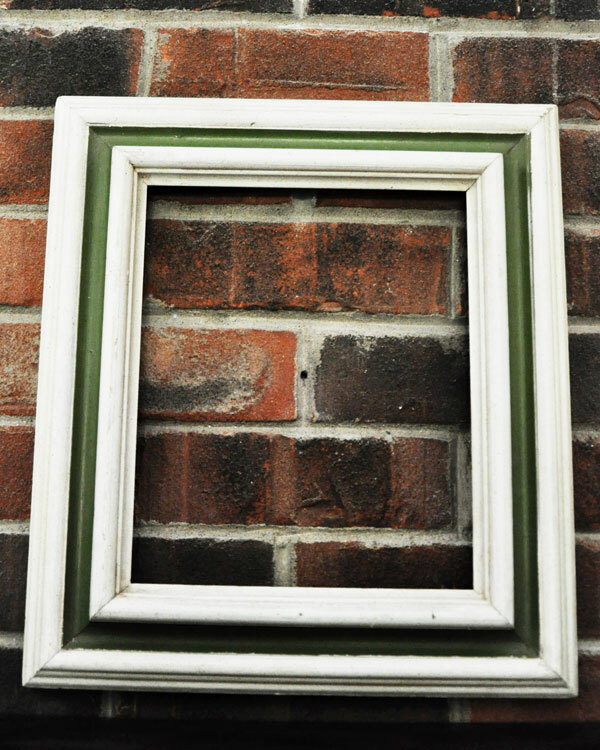 Frame your artwork. 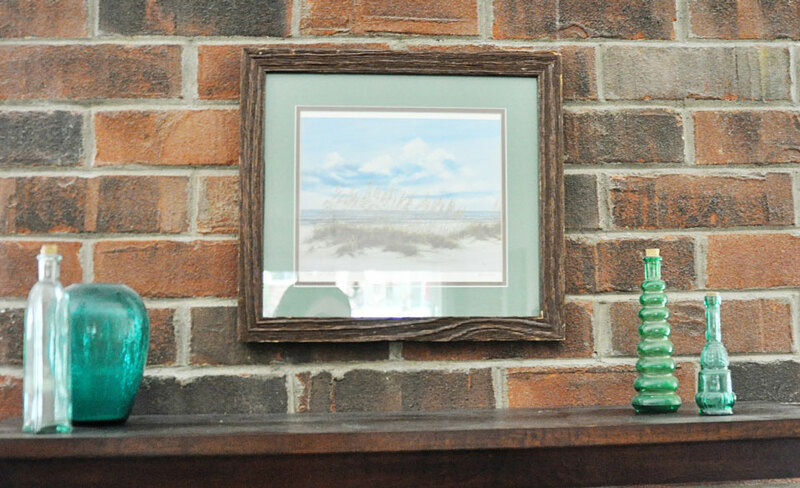 It looks great in that green and white frame. 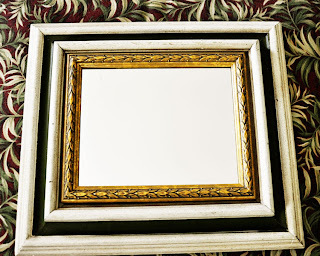 You can always find another frame to fit the mirror - since you have to paint the mirror anyway. I'm definitely tempted to do the monogram thing, although I've never done one before. So, I'm a bit intimidated by it. But, I'm also torn between that and just using the artwork. What to do! I just don't know. I'm hankering to get to spray painting the other stuff, so once I've had a chance to do it, I can't wait to post the before/afters. That is my kind of birthday present. 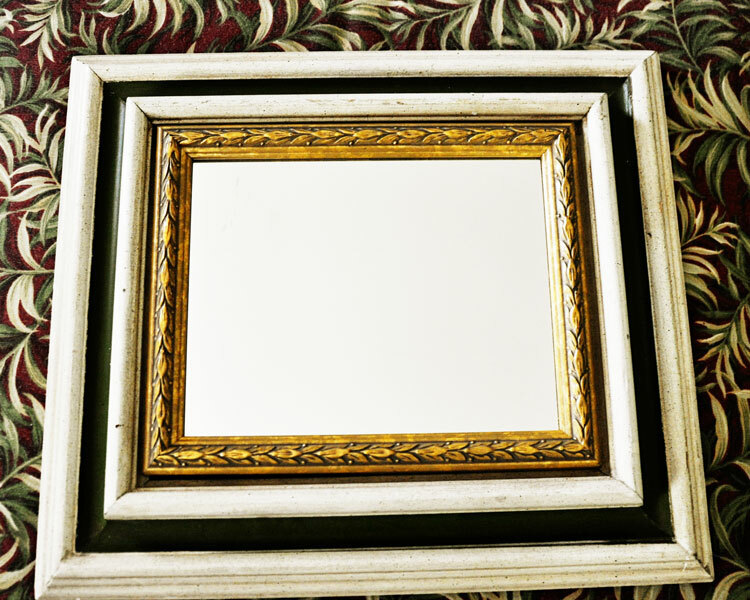 I just wanted to suggest a nice soft black would look lovely on the mirror frame. 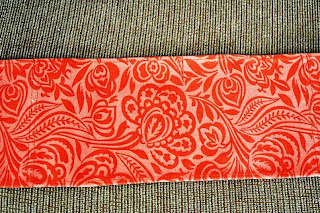 It is a nice piece, good find.